Home / Anime / Batman Ninja Anime Trailer is Awesome! Batman Ninja Anime Trailer is Awesome! Check out the new trailer for the Batman Ninja Anime coming out next year. The trailer on the bottom was first released at New York Comic Con this year. 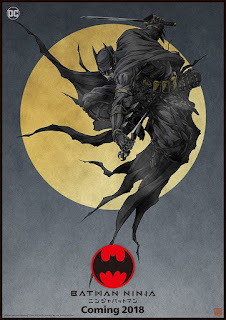 Batman Ninja gets released in 2018 directed by Jumpei Mizusaki, with the screenplay by Kazuki Nakashima, character design by Takashi Okazaki, music by Yugo Kanno, and animation production by Kamikaze Douga. The voice talent for Batman Ninja includes Koichi Yamadera (Dragon Ball Super, Ghost in the Shell) as Batman, Wataru Takagi as The Joker, Ai Kakuma as Catwoman, and Rie Kugimiya as Harley Quinn. Monk is the son of an alchemist and the archivist of his people’s history. On his thirteenth birthday following the tradition of his people, Monk sets off on an inner journey to find himself on the way to becoming a man. Along his spiritual odyssey, he discovers his worst nightmares that challenge his inner strength. Using the knowledge of his people that was passed down through generations, he learns who he really is, but at great personal sacrifice. Sea of Solitude Game looks creepy and amazing! First Issue of Prisoner of the Mind is FREE Today!